Join us in congratulating Kim and Karenza on their New Zealand Honeymoon win! As nature, food, and wine lovers, this honeymoon is a perfect fit for them. We’re so thrilled they’ve won our honeymoon package. They will travel to New Zealand in September to enjoy all the special features of this prize giveaway. 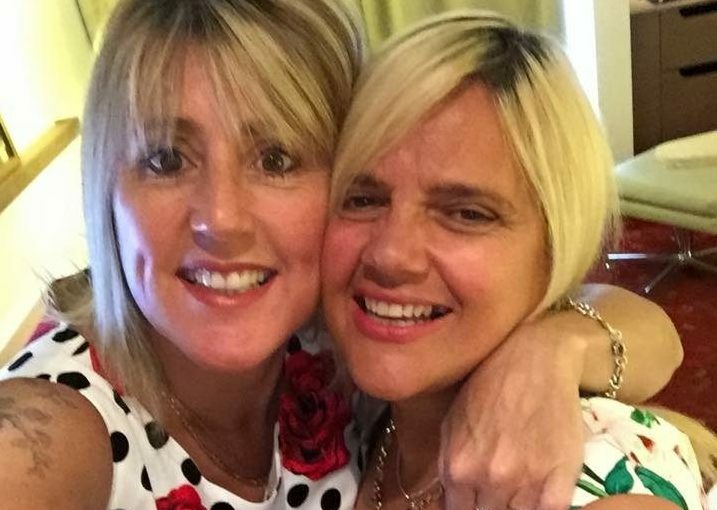 Kim and Karenza have been together 5 years and are planning a wedding in Melbourne. Surrounded by their friends and family, they’ll marry to celebrate their love and commitment to each other. Their two children will be there to join in the festivities. We’re so honoured to be taking care of them on the honeymoon of their dreams. Kim and Karenza will spend 5 days in New Zealand’s Marlborough Sounds and Nelson Tasman regions. These two regions offer some of the best romantic nature escapes and wining and dining experiences in New Zealand. Whether it’s the breathtaking vistas in every direction, the star-filled nights, the mystique of the Marlborough Sounds, or the European flavoured vineyards, Marlborough has romance written all over it. Couple that with sun filled days and the golden sand beaches of Nelson Tasman, and you’ve discovered the perfect honeymoon escape. Our valued partners are eager to pamper Kim and Karenza and all of our LGBTQ honeymoon couples. See what Kim and Karenza will be doing on their honeymoon in New Zealand. Start the day with a Marlborough Icons Tour. Enjoy a wine tour in the morning, a delicious waterfront lunch, and a relaxing seafood cruise for the afternoon. 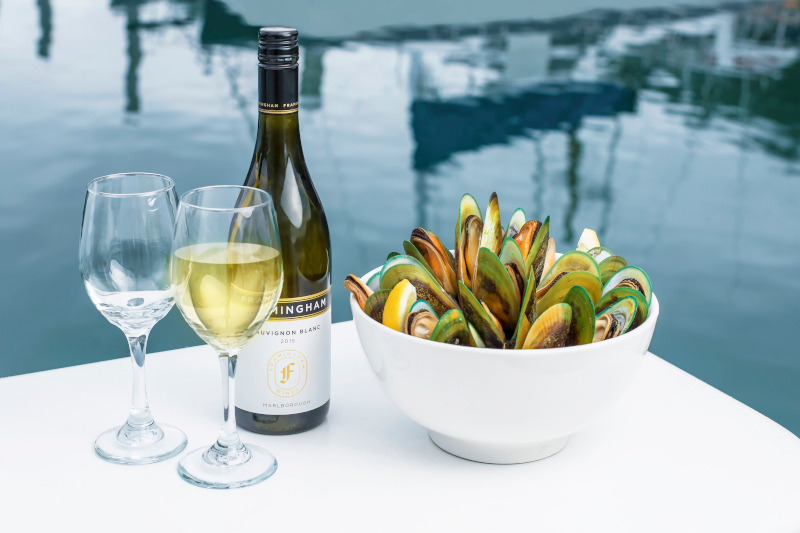 Sample fresh local seafood and Marlborough Sauvignon Blanc as you cruise the Marlborough Sounds. 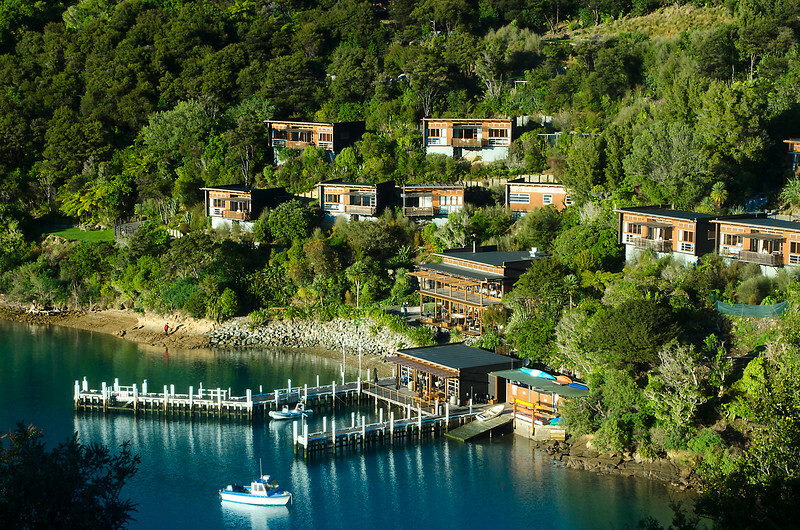 Arrive at the remote Bay of Many Coves Resort, a luxury five star resort tucked into a tranquil bay in the sounds, and home for the next two nights. Indulge in a 3 course dinner that captures the art of culinary freshness and creativity and sip on your complimentary world-class Sauvignon Blanc. 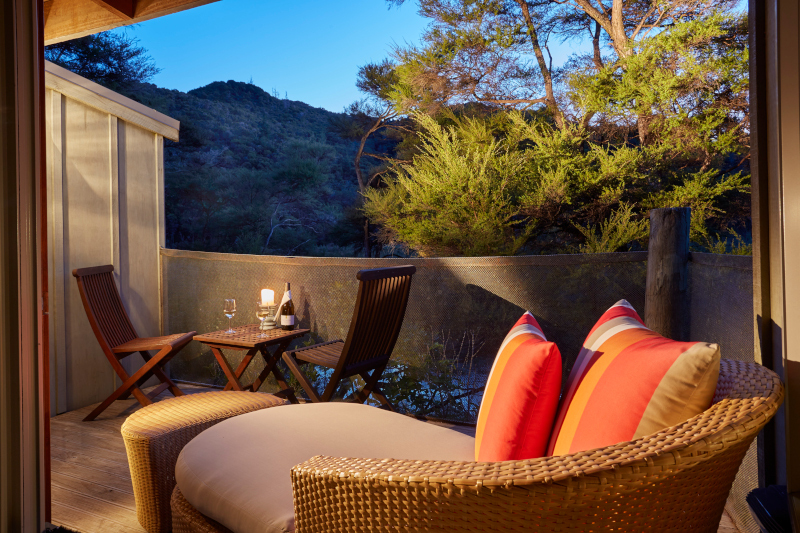 Relax and enjoy the many activities on offer at this romantic sanctuary: spa treatments, walking or hiking, kayaking, SUPing, wildlife cruises, and bird watching to name a few. Marvel at this tranquil paradise over another sumptuous 3 course dinner. Travel through to Moutere to meet Nicki and Lisa from Wheelie Fantastic, who will set you up on your self-guided Moutere Wine and Artisans Bike Tour. Pedal through the scenic boutique wineries of Nelson, visit artisan’s studios, and appreciate the stunning vistas of the Moutere area. 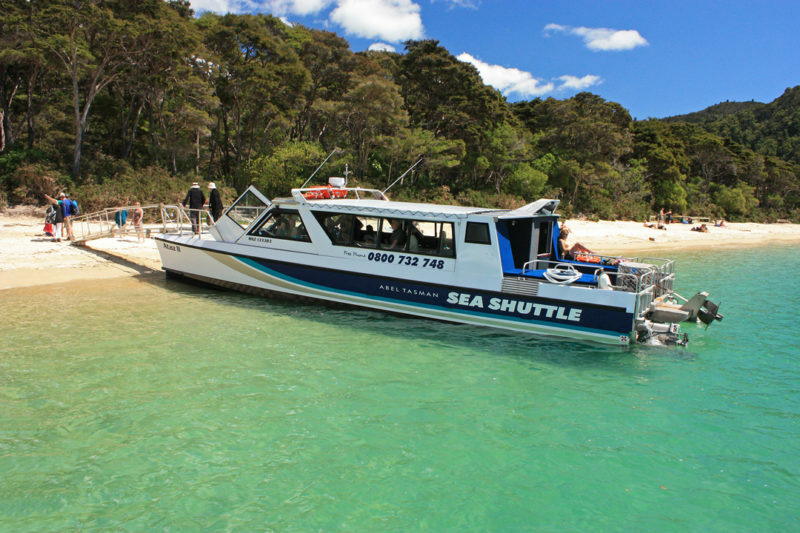 Cruise across the turquoise waters of Abel Tasman National Park with Abel Tasman Sea Shuttles to your next remote hideaway lodging for the next two nights, Awaroa Lodge. Appreciate the culinary creations from the lodge’s organic garden for dinner, paired with your complimentary wine. The chocolate truffles will be a perfect after dinner treat. Surrounded by golden sand beaches and gorgeous waters, you have full day to hike, kayak, cruise or sail in Abel Tasman National Park. We’ll help you choose a day filled with romance, fun and excitement. Begin your journey home via Nelson or Blenheim and cherish the memories you’ve created during this celebration of your love. A personal transfer to Nelson Airport from Mapua 41 South. Kim and Karenza, we can’t wait to take care of you in New Zealand. The countdown is on. Want to honeymoon like Kim and Karenza? Talk with us about this honeymoon package, or let us create one just for you based on your desires, time, and budget. We’d be honoured to take care of you for such a special occasion. Wow! What a great honey moon package! Congratulations Kim and Karenza. I hope you enjoy your wedding and have a really lovely time in New Zealand.